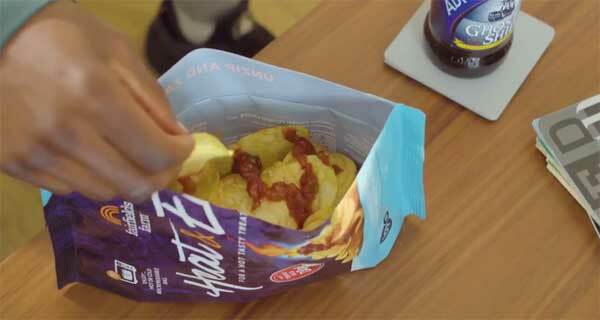 British snack company, Fairfields Farm, has developed a new concept in snacks: microwavable crisps, designed to produce hot crisps as if they had been hand-cooked at home. Designed to revitalise the snacking market and give consumers a whole new eating experience, Heat & Eat breaks new boundaries not just in concept, but also in packaging and design using a patented pack which enables consumers to tear the bag open, remove the dip, microwave for 30 seconds and then enjoy delicious, hot fresh crisps, just as if they’d been handcooked at home. According to Robert Strathern, founder of the Wormingford, Essex-based producer that has been producing potato and vegetable crisps since October 2006, the idea for microwavable crisps was born from the company’s love of its hand-cooked crisps eaten fresh from the fryer. “We love how fresh our crisps taste when they’ve just been cooked,” he said, noting it took the company 18 months to develop the concept from idea to final product. Heat & Eat – to be rolled out in Tesco and other retailers across the UK on September 11 – consists of a 125g bag of hand-cooked crisps that comes with a 50g dip. There are two flavours: Sea Salt with Tomato Salsa Dip and Cheese & Chive with Caramelised Onion Dip for a RRP of £2.49 ($3.24). Strathern told BakeryandSnacks.com that the reaction to the product has been overwhelming. “The launch on The Sun’s social media channel last week has created a real buzz,” he said. Strathern contends the hand-cooked snack market is now quite mature, with innovation centering around flavours, rather than concepts. “We’ve come up with something that’s not only unique, but that also creates a whole new snacking occasion. Heat & Eat is a talking point,” he said. The patented bag can be placed upright in the microwave on high for 30 seconds to produce hot crisps as if they had been hand-cooked at home. A laser-scored, easy-tear opening system also allows consumers to cleanly open the bag from top to bottom, meaning that the pack can be merchandised in the portrait position, but heated and stood horizontally to be easily shared. Fairfields Farm has linked up with Shazam, an English app development company, to allow consumers to fully understand the concept of Heat & Eat through a video and other information. Last year, Fairfields Farm, which also produces lentil bites and tortillas, reported earnings of £2.5m ($3.2m). It hopes to extend the distribution of Heat & Eat beyond the borders of the UK.